Take a look at the fuels and products delivered every day by America’s sprawling network of liquid petroleum and natural gas pipelines, and you’ll develop a new appreciation for energy infrastructure: gasoline, diesel, jet fuel and other fuels and natural gas and heating oil for our homes. Plus feedstocks to make products ranging from eyeglasses to pharmaceuticals. Pipelines are integral for modern living. 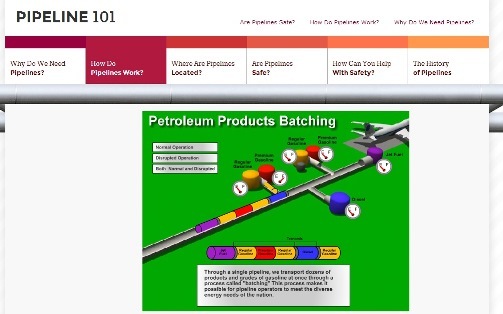 That’s why API’s recently launched “Pipeline 101” website is an important resource – to better understand the need for pipelines, as well as how they work, how safe they are and more. For example, did you know the United States has 185,000 miles of petroleum pipeline and 2.4 million miles for natural gas? Liquid petroleum pipelines are usually the only feasible way to transport significant volumes by land over long distances. Without pipelines, our streets and highways would be overwhelmed by the trucks trying to keep up with the nation’s demand for petroleum products. Pipeline companies work to prevent releases by evaluating, inspecting and maintaining pipelines in a program called integrity management. Integrity management programs have produced decreases in incidents attributed to every major cause of failure. Pipeline companies together fund millions of dollars’ worth of research into new inspection technologies and spend billions on safety each year. Mark Green joined API after a career in newspaper journalism, including 16 years as national editorial writer for The Oklahoman in the paper’s Washington bureau. Previously, Mark was a reporter, copy editor and sports editor at an assortment of newspapers. He earned his journalism degree from the University of Oklahoma and master’s in journalism and public affairs from American University. He and his wife Pamela have two grown children and four grandchildren.